This Wednesday, Ireland is due to pay back €1.25 billion to unsecured and unguaranteed senior bondholders in the now defunct Anglo Irish Bank. The Anglo bonds in question were taken up in 2007 by investors who wanted the higher returns the bank was able to offer as the most reckless player in the hyperactive Irish property market at the time. Even then, it must have been clear to the investors that there was an element of risk involved. That was why a higher yield was on offer. Anglo was the new kid on the Irish banking block and was disregarding basic rules and taking huge gambles on property to grab market share from its much bigger rivals, Bank of Ireland and Allied Irish Bank. The Irish property market was near boiling point, and already some commentators were pointing to the steam rising from the overheated pool. All of this was known, but these investors went ahead anyway. They took the risk, attracted by the returns. Most of them were major players, investment funds and banks, mainly French and German. Being big boys, they knew there was a risk involved. That's capitalism. You can win big. You can lose everything. Like the tens of thousands of Irish people who were small shareholders in the Irish banks and have now lost everything, the holders of these unguaranteed Anglo bonds should now be losing everything as well. But they're not. In fact they're getting everything back, thanks to the policy being forced on Ireland by the European Central Bank and accepted by the gutless Irish government. The bonds mature this Wednesday and, having enjoyed their high yield over the past five years, the investors are now to be paid their money back in full. They're getting everything back, even though the bank is now defunct and is being investigated by the Gardai (police). It's not just unfair, it's ridiculous. Thanks to the misguided state guarantee given by the previous government to all the Irish banks when the crisis hit in 2008, it's the ordinary Irish person who will have to pay the bill. The money will be sucked out of the Irish economy through higher taxes and cuts in state spending. To understand the scale of this, bear in mind that €1.25 billion -- or €1,250 million -- is equivalent to the total return that will come this year from all the tax hikes and spending cuts that were in the budget in December. Those budget measures which will be implemented over this year will cause real hardship to the Irish people. There are higher taxes for everyone and cutbacks in all kinds of state spending and services like schools and hospitals. Yet the same amount of money that all this agony will produce is going to be blown away this Wednesday because our government has decided that it must obey the EU/ECB/IMF position that Ireland has to pay back all its bondholders in full. Repayment of bondholders in full was one of the conditions under which we got the EU/IMF bailout money to keep the state going. Unless we repudiate these terms and say that we won't pay without a massive write down of our enormous debts, we will go on repaying until we are bled dry. 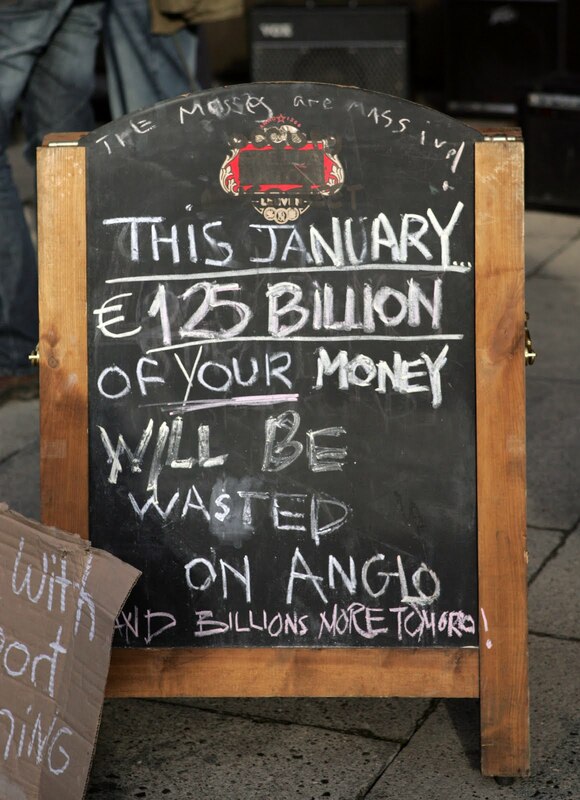 This week's €1.25 billion is only the start of the Anglo misery. The Anglo black hole is around €30 billion. We are going to be paying it back for years to come. Then there is all the debt we have piled up through our €67.5 billion EU/IMF bailout, money that is being used to keep the state going until we can balance our budget again, and money that is being used to recapitalize the two main banks and allow them to meet their debts and avoid going bust like Anglo. The total amount of our debt, including interest, will be way over €100 billion and will take us decades to repay at a rate of a few billion a year. As we said here last week, the immense scale of the problem means that the present way of dealing with it is not a viable solution. Apart from it being unfair to the Irish people, both this generation and the next, it's unworkable. If we try to do it, the Irish economy will shrink drastically and then remain in permanent recession. The Irish people, in spite of the efforts of the government to play down the situation, are now beginning to fully understand what is going on. Listening to reaction here last week, it's clear that they think it's the greatest con job in economic history and that they are not going to accept it. In particular, people were most unimpressed with the EU/ECB/IMF bailout team who were in Dublin last week and gave a press conference to pat us all on the head after examining the state's books. These three-monthly reviews are part of the structure of the bailout; to keep getting the money we have to pass the quarterly examination which monitors our progress on budget reform. These press conferences have become a routine matter at this stage -- but this one was different because the veteran Irish journalist Vincent Browne confronted the bailout boys on the absurdity of repaying the Anglo bonds. Why should we repay them, Browne asked, since the bank is now defunct, the bonds were not guaranteed and the Irish people had no responsibility for the disastrous -- and at times illegal -- manner in which Anglo was run. The three bailout boys from the EU, the ECB and the IMF who were taking the questions looked at Browne with the condescension common among senior economists. They smiled at him like the exasperated parents of a child who just doesn't understand the complexity of the grown-up world and came up with some non-answer. But the famously cantankerous Browne persisted. After some delay, the man from the ECB, Klaus Masuch, suggested that the reason Ireland had to repay the unguaranteed Anglo bondholders was to preserve the credibility of other Irish banks. He emphasized that the decision was taken by the Irish government, although he made clear that this was the preferred policy of the ECB. What Masuch actually said was, "I can understand that this is a difficult decision to be made by the government and there’s no doubt about it, but there are different aspects of the problem to be balanced against each other and I can understand that the government came to the view that, all in all, the costs for the Irish people for the stability of the banking system, for the confidence in the banking system of taking a certain action in this respect which you are mentioning, could likely have been much bigger than the benefits for the taxpayer which of course would have been there. Did you follow that? This guy, God help us all, is the one of the top boys at the European Central Bank. To be fair to him, English is not his first language and he was trying to simplify things for Browne. But that reply was rubbish. The idea that giving a haircut to investors foolish enough to put money into a cowboy bank like Anglo would scare off investors from the two big Irish banks in the future is not credible. The idea also that because Ireland guaranteed all the banks here we have to honor all the Anglo debt and that it would be seen as a state default if we don't is nonsense. Let's remember that when we gave the blanket guarantee in 2008 the government was grossly misled by the banks on the scale of the problem. Now we know the truth and it's 10 times worse than we were told back then. And that is why we are now entitled to modify the guarantee that we gave, especially in relation to unguaranteed bondholders in Anglo, among others. The other side to this is that many of the original holders of these bonds probably sold them on some time ago to speculators at a big discount. And these guys are now going to make a killing when the Irish government, courtesy of the Irish taxpayer, pays them the full value of the bonds this Wednesday. This is not just a one day problem. In the bigger picture it doesn't matter all that much whether (as seems certain) the government pays back the €1.25 billion to the bondholders this Wednesday. The trouble is there are a lot of other Wednesdays coming down the line. We need to raise taxes and cut spending to balance our budget again. We can do it, although it's going to be very tough for a few years. The problem is that even if we do this we are still left with a mountain of debt run up by our banks, the bill for which, including interest, will be a few billion a year for years and years. Without debt forgiveness we will be sucked dry for at least a decade, maybe two or three decades. As we said in this column last week, it cannot be done without destroying Ireland. This week, as Ireland plays the most obedient boy in the EU class again and pays back bondholders in full, the Greeks are getting a write down in their debt of 60% or 70% by being the dangerously disruptive kid in the EU class. It's time we started kicking back.